Dulcie is a fairy and Regulator, law enforcement to the paranormal who has had a run of bad luck turned into a gross monster that requires her best-friend to try and change her back and then to find out she was the last person to see the jerk who made her into the monster alive. Could things get any worse? Of course they can. Knight needs Dulcie to aid him in finding out who is murdering the creatures but she cannot let anyone know who he really is and that she is working for the top of the ladder. Dulcie would much rather just write her book that is going to allow her to retire from being a Regulator but unfortunately that is not going to happen anytime soon now that something is out there killing others and she has to do all that she can to stop it before it is to late. And of course now she has to also deal with the Knight and the feelings he brings out in her. 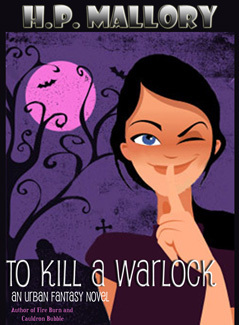 To Kill a Warlock had me laughing from the first paragraph and kept my attention all they way through it has suspense, romance and humor that will keep the reader engrossed. I cannot wait to see what happens next to Dulcie, Knight and the rest of the characters brought to life by HP Mallory.